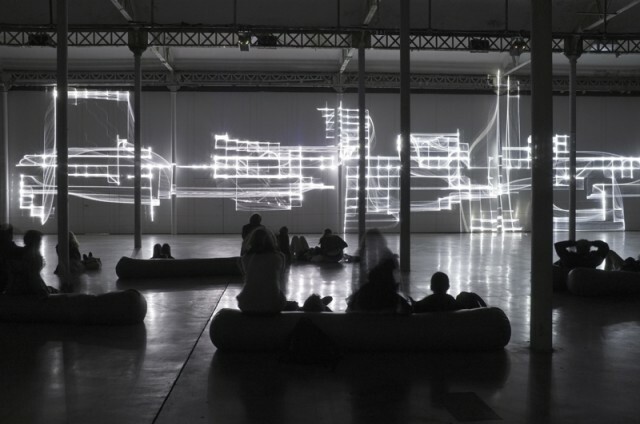 Stunning work, sonically and visually, from Robert Henke. Photo courtesy the artist. Mastery of technology need not be an end in itself, a showcase for mechanical sophistication. It can mean finding the point at which you push a medium to be its most expressive. And I suppose that’s why so many can admire the ongoing work of musician and media artist Robert Henke. The lasers in ‘Fragile Territories’ are not the crude, awkward beams you probably know from kitschy planetarium shows. Instead, they form a spidery lace so exquisite, you could imagine them as being part of something crackling with organic life – or the workings of a fanciful undersea electro-luminescent metropolis. Henke’s score, too, crackles at the edge of being, the foreground sound as tightly focused as the lasers, against a dark, warm wash that breathes beneath. That’s a direct analog for the visuals, which cast a slow-moving shadow against these white beams. It looks brilliant in the documentation, but I know seeing lasers in person is another experience entirely. The work travels from Nantes, France next to EMPAC in New York state. Fragile Territories in Nantes November 2012 from Robert Henke on Vimeo. Four powerful white laser beams draw a floating white object on a thirty meter wide and six meter high wall in a completely dark hall, slowly evolving shapes, edges and curves of shimmering, pulsating light. The visual and the auditive component are created in realtime using statistic and stochastic algorithms. As a result, the duration of the work is infinite and it never repeats. Due to the complex nature of the code and its embedded randomness, it is quite impossible to predict future states. However, additional rules within the program ensure that the installation cannot ‘explode’ or ‘fade away’ but instead always swings back into a more or less stable state after it reaches certain boundaries. Robert worked here with Michel Waehling, who provided additional hardware and programming, though Robert himself did “lead programming, musical composition, visual algorithm design and direction.” It’s an epic achievement, I think, even by Robert’s own high standards. I hope to see it in person myself.